Though Masouleh has been around for hundreds of years, the history of the village dates back even further. In 1006 AD, some 6 km (3.7 miles) northwest from the present day town, Masouleh was a thriving commercial spot for the ironworks industry trade and home to hundreds of families, who lived in the stacked houses that have become synonymous with the town. But the scenic setting suffered a tragic fate. A deadly plague epidemic, attacks from neighboring villages and a huge earthquake led people to rehouse several kilometres away, reconstructing their original home. The so-called ‘Old Masouleh’ now sits as an ancient site consisting of empty land with strewn rocks, while around 180 families live in the new town. Despite its tragic origins, the new village, built after the plague in 1565, has retained the charm of its ancient predecessor. It is said ‘the yard of the building above is the roof of the building below’, as houses are interconnected and form the pathway to climb even higher into the hill village. Masouleh’s houses are towered as high as possible to avoid flooding, strong winds and cold temperatures that occur on the lower ground level. Having the architecture stacked in this in this way allows the village to keep an optimum temperature and solar exposure, making it more comfortable and safer for the residents now. The houses are also bright yellow in colour – designed with Masouleh’s unique climate in mind, the paint ensures that they are visible through the fog. At an elevation of 100 m (328 ft), the walk up is one to take your time over and to look out onto scenery. The village has fantastic views of its surroundings, being 1,050 m (3,445 ft) above sea level in the Alborz mountain range. 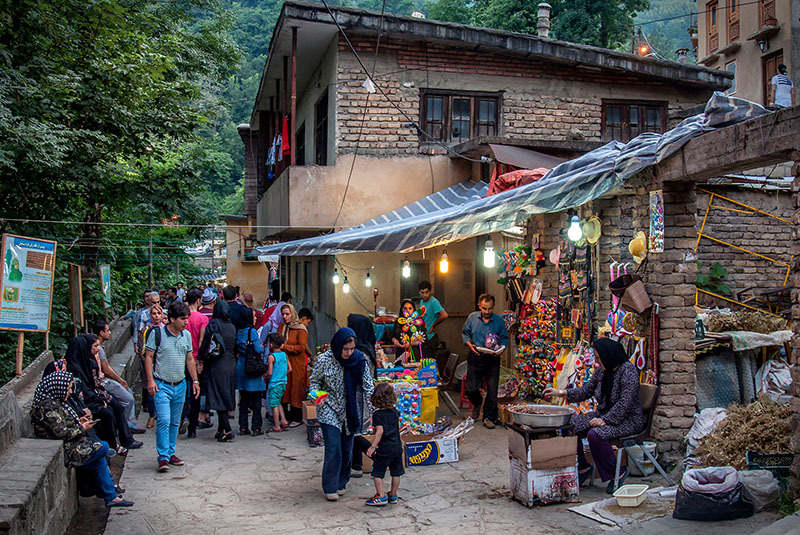 Summer is a popular time to visit Masouleh, as the northern temperatures of Iran are a lot cooler than the rest of the country. It can get busy at this time though, so to avoid crowded tour buses, you can choose to stay overnight or hike in the surrounding mountains. Alternatively, winter is a good option with fewer visitors around. Temperatures drop to around 10°C (50°F) then, but still provide a picturesque setting as the rooftops are often layered in snow. Masouleh is perfect for a day visit from Rasht or Fuman. It provides a fantastic alternative to Iran’s bigger cities and an opportunity to escape the traffic in Iran. After all, due to its layout, Masouleh is the only city in the country where motor vehicles are not allowed to enter. The winding ascending lanes of the village are full of handicraft shops. Take a pitstop in one of the many teahouses on your way up to the top too. For traveling around, it is useful to note that you locals speak Talesh, a northwestern Iranian language, here. Talesh is also spoken in some southern regions of the Republic of Azerbaijan. A total of 200,000 people speak it, making it incredibly rare in comparison to the 110 million people who speak Farsi.